Search our collection of Biltmore-inspired recipes created by our talented estate chefs. Keep family and guests coming back for more when you serve these sweetly savory cornbread muffins as a complement to your harvest feast. Enjoy this deliciously sweet and savory recipe, courtesy of The Dining Room at The Inn on Biltmore Estate, with Biltmore Estate Chardonnay. This is a great salad that can be adapted to work year-round. 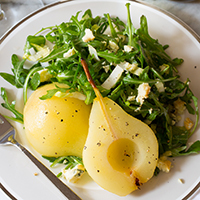 By just changing the fruit to a seasonal fruit, will keep your guest loving this salad for any occasion. The vinaigrette pairs well with many types of lettuces, especially bitter greens. This recipe was created for Biltmore by Chef Vivian Howard of A Chef’s Life on PBS. She says, "I grew up eating sweet potatoes nearly every day, but we never ate the skin. Now in my PBS-appointed role as flag-flier for Southern ingredients, I’m making a case for the pleasure and versatility of sweet potato skin. I like to roast sweet potatoes whole, then cut them in half and scoop out all but a thin scattering of the flesh. Crisped up in a pan with some oil and finished with a Vivian-sized pinch of salt, these halves can be treated like taco shells on B-vitamins. They make crunchy croutons that are the perfect counterpoint to a spicy arugula salad." This salad offers a delicious mix of textures and flavors, from fresh arugula, creamy avocado, and crisp cucumbers to the richness of the salmon with a tangy splash of citrus vinaigrette. Biltmore Smoked Salmon makes it easy to create a gourmet dish in mere minutes! Most rib lovers say "there's no such thing as a bad rib," but the debates over what constitutes a great barbequed rib can take on religious proportions. The Stable Café's interpretation of the perfect sparerib is sweet, spicy, smoky, and almost fall-off-the-bone tender. Smoky grilled oysters with a zesty bourbon chipotle butter. This appetizer pairs beautifully with Biltmore’s Limited Release Pinot Grigio. From the chef at Village Social. This fall game dish is perfect to enjoy with a glass of Biltmore's The Hunt Sonoma County 2012. Count on this fun and delicious cocktail to liven up any gathering or serve as an aperitif before your meal. 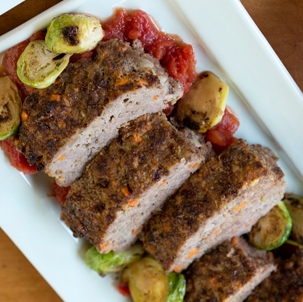 When it comes to comfort food, nothing satisfies like meatloaf. For a leaner take on the traditional recipe, our Biltmore chefs updated the classic dish with bison plus a helping of hearty harvest vegetables.